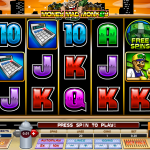 Money Mad Monkey is a Microgaming slot which resembles an old PC game. The slot has a design like a real slot machine which makes the game play more enjoyable. Still this is an older slot game so the animations are low and the symbols have a simple design. 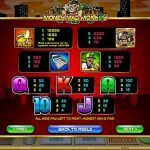 But nevertheless Money Mad Monkey is an attractive slot game simply because it has interesting bonus features and can produce payouts of up to 400.000 coins in a single spin. This is reason enough to give it a try for real play. The wild symbol in Money Mad Monkey is the Banana and it will award a 10.000 coins payout for 5 of a kind combinations. He will also substitute for all other symbols except the scatter. If you manage to land 3, 4 or 5 Bonus symbols anywhere on the reels you will trigger the Trail Climb Bonus. This is a cash bonus where you roll the dice and make your way up to the building. The goal is to get to the top floor and collect all of the prizes along the way. If you land 3, 4 or 5 Barrels anywhere on the reels you will trigger the Barrel Bonus. Here you need to pick one Barrel which will award a prize multiplied by your stake. 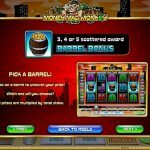 Money Mad Monkey also has a free spins bonus which is triggered by landing three Free Spins symbols on reels 1, 3 and 5. You can choose to play 5 free spins with x8 multiplier, 10 free spins with x4 multiplier or 20 free spins with x2 multiplier. As you can see Money Mad Monkey has a rich pay table and very attractive bonus features which can produce big payouts. This is the main reason why Money Mad Monkey is still a popular slot across Microgaming casinos even today. We believe that mermaids bring good luck and that’s why you should consider playing Mermaids Millions a 5 reel slot by MicroGaming.